It’s official—there’s another full-frame digital mirrorless offering to mix it up with Sony, Nikon, and Canon—the Panasonic LUMIX S1 and S1R. It’s not like this has been a secret, as it was part of a development announcement at Photokina back in September. But now we have all the specs and can begin to get an idea how these new bodies will fit into the scheme of things. While late to the party, Panasonic brings some very interesting features and factors into an already crowded field. First, it is now part of the L-Mount Alliance, a very clever cooperative agreement among Leica, Panasonic, and Sigma in which all will use the proven wide throat/short flange distance Leica lens mount. 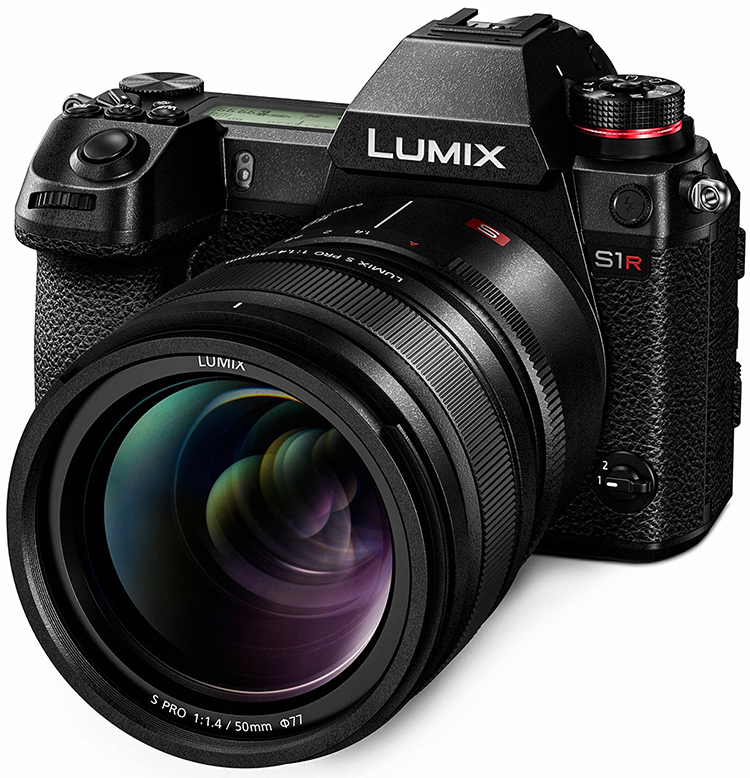 While the S1/S1R will debut with just three new Panasonic lenses, Leica already has five primes and three zooms with the same mount. There are numerous sites with full specs and preproduction reviews. A few will be listed below. But here are some early observations. Built tough, for pro-level use. Size and general design comparable to high-end DSLRs. Strong moisture and dust sealing, cold resistance. 400,000-cycle shutter. Substantial battery. All good news for bodies likely to see use in harsh environments. In-body stabilization which can combine with lens stabilization, and a viewfinder graphic that displays shake intensity. Twin memory card slots, one for XQD (firmware upgradeable to CFexpress). Keeps the path open for high throughput as storage systems evolve. Very high resolution electronic viewfinder with three optional magnification levels—a boon for those who wear glasses. 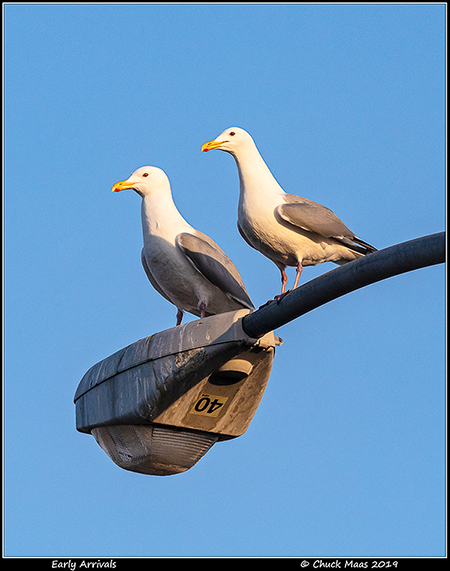 For those intent on extracting the highest image quality possible from a static scene—a High Resolution mode that combines eight consecutive images automatically for a total of 96MP on the S1 and 187MP on the S1R. I find this a very intriguing offering. This pair of new bodies raises the bar in several categories. Technology on the march. Spec list and Panasonic announcement. What You Need to Know (DPReview). The 10 Main Differences (Mirrorless Comparison). One of the mundane but crucial elements of digital workflow is the storage and transfer of image captures from camera to computer. Anything that speeds that up improves efficiency and effectiveness. As memory card types and protocols advance, so do the devices used to transfer files. ProGrade Digital offers several “workflow readers” in multiple formats using the high speed USB 3.1 Gen 2 data transfer standard. All are dual-slot units with combos of CFast/SD, CompactFlash/SD, SD/SD, and microSD/microSD. As a point of reference, ProGrade Digital was formed only about a year ago by former Lexar executives after Micron ceased making memory cards and sold the Lexar brand. They’ve come on strong as a major force in the memory card market. Winter came late this year in Anchorage, and it wasn’t until December that we had significant snowfall. Now we’re making up for it. Temperatures have been very mild as well and wildlife doesn’t seem to be having any trouble getting around. 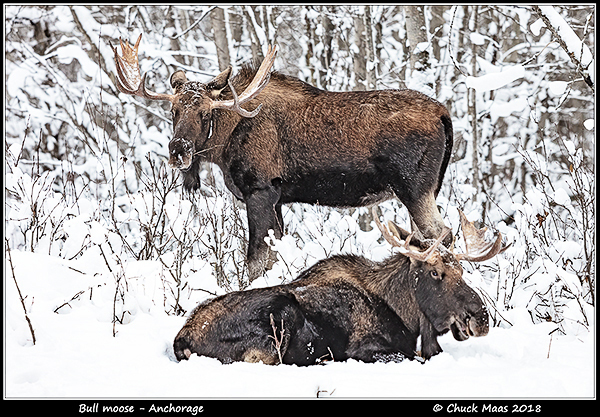 These two bull moose were lazily browsing near a church in the middle of town. The announcements of new photo tools prior to Photokina are coming fast now. Here are links to a few. The Canon R full-frame mirrorless system. Highly anticipated and a bit earlier than some thought might happen, Canon is opening with a mid-range body. The biggest question that has been answered is that yes, they will use a new lens mount (RF) and a series of adapters to accommodate the huge inventory of existing EF lenses. The first native RF lenses are impressive, and an additional official roadmap for more is expected soon. Also from Canon, Mark III versions of the EF 400/2.8 and EF 600/4 supertelephoto lenses. Most significant here is weight reduction—2.2# and 1.9# respectively. Hopefully they will be as optically stellar as previous versions. Fujifilm brings the X-T3. Retaining the same highly-attractive retro design with real dials for primary settings, the X-T3 has a new, slightly higher-resolution sensor and a host of other internal upgrades, including big video improvements. Fuji has a somewhat unique positioning in the industry and a strong following. At the stratospheric end of the spectrum, Phase One’s new “Infinity Platform” offers a choice of three different medium format backs—two 150MP units and one with only 100MP. Ranging between $48,000 and $55,000, when you pick one of the backs, a camera body, prism, and prime lens of your choice comes with it. With the announcement of Nikon’s full-frame Z 6 and Z 7 mirrorless bodies, we’re getting very close to having all the major players fully engaged. Canon will bring their own full-frame model in the coming months to complete the process. Technology marches on. It was 10 years ago that Panasonic brought out the first mirrorless interchangeable lens camera—the Lumix G1. Micro four thirds sensors led the way for quite a while, though Fujifilm stirred things up with the X-Pro1 in 2010. Then Sony entered the market, first with APS-C sensors then moving to full frame, and has made a very big slash. Within the last two years Fujifilm and Hasselblad raised the bar higher with 50MP medium format models (GFX 50S and X1D-50c respectively). I’ve been using a Panasonic G9 for a few months. As a dedicated Canon user for many years, retraining brain and muscles to accommodate a markedly different camera workflow has been a challenge. When applied methodically, some results have been very good, though I’m still much more familiar with Canon operation and have a higher success rate using the “old” tools. Time will tell. Canon has yet to make their statement. The speculation has been rampant for months and it will likely be a little while yet before we know the answers. One key question is whether they will stick with the EF mount or go a similar route to Nikon by using a new mount and a dedicated adapter for the over 130 million EF lenses in the field. Interesting times ahead. Photokina in Germany has been the international showcase for state of the art imaging products since 1950. In 1966 the trade fair established a biennial schedule, but that will change next year when it will become an annual event happening in May instead of September. In addition, the managers intend to expand coverage beyond its tradition emphasis on cameras and photography. Photokina 2018 is next month—September 26-29. The run-up to the event is usually filled with hint, pre-announcements, or even formal announcements of new product, and this year is no exception. Nikon is in full swing with their series of teasers regarding their upcoming full frame mirrorless camera, and Sony is claiming market leadership with their “Be Alpha” campaign. Most manufacturers are sure to bring their best efforts, though at least one (Olympus) has stated they will not have a classic stand at this year’s event. So the next six weeks will be full of photo news, though more is sure to come after the show and before the end of the year. Of special interest will be Canon’s answer to full frame mirrorless. Apparently they are choosing to let Nikon take the limelight for the moment, and make their entrance after the dust has settled a bit. A host of dedicated Canon users are anxious to see what they’ll bring, especially how they will address access to the huge number of highly-regarded EF lenses in personal inventories. Of course technology marches on, and sometimes it’s prudent to make a big step toward the future as Canon did in 1989 with the original EF mount. We should know much more within the next six months. 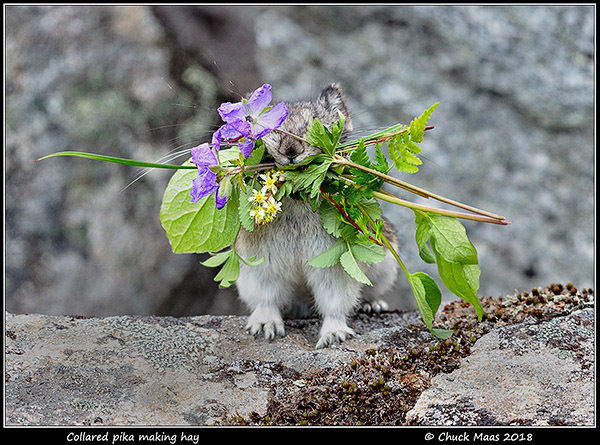 Small creatures are working hard this time of year to gather enough material to get them through the winter that’s right around the corner. 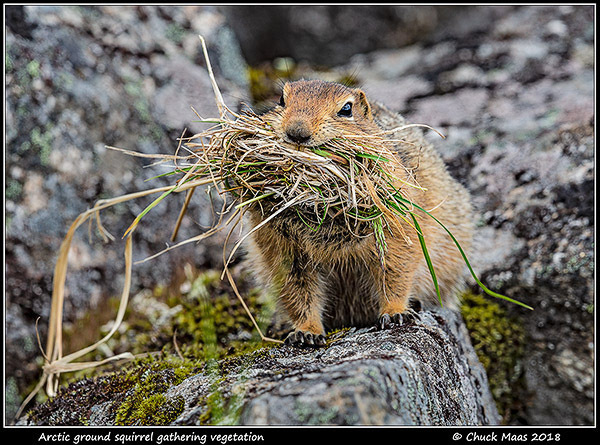 Days are rapidly getting shorter and pikas and Arctic ground squirrels aren’t wasting any time collecting their stores. 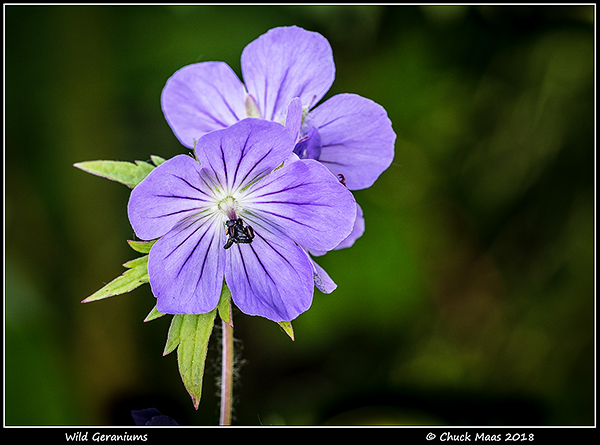 The blooming of summer continues in full swing with wild geraniums at their peak, along with larkspur, chiming bells, and many others. Fireweed has begun to add its bright magenta hue as well. It’s all part of the rush to grow, blossom, and seed is a few short weeks before winter arrives again.